Sealaska Heritage Institute (SHI) has launched a new program to offer Alaska Native artists’ residencies, which will include dedicated work areas, access to archives and collections and monetary support. The goal is to provide artists with a substantial amount of independent studio time to delve into their practice and to avail themselves of professional development opportunities. Through the program, SHI will offer a total of two months of residencies at the Walter Soboleff Building artist-residence studio. Artists will receive stipends for their time, funds for materials and supplies and rental cars. Although it is not a teaching position, artists will be required to offer one public workshop or demonstration at SHI and participate in an assessment of the residency program. “This is an opportunity for artists to make their own work while engaging with the arts education community,” Worl said. Applicants whose work engages with cultural traditions through materials, techniques and subject matter will be encouraged to apply. More information on the application process coming soon. 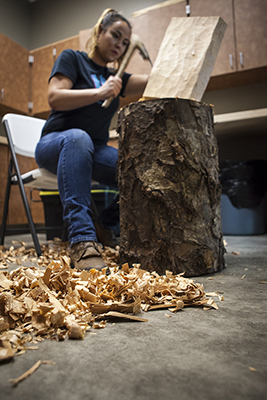 Caption: Tlingit artist Alison Marks carving in the institute’s Delores Churchill Artist-in-Residence Studio, which will be made available to applicants.